Citigroup’s chief economist Willem Buiter says Ireland should have a second funding deal wrapped up before the first one runs out. 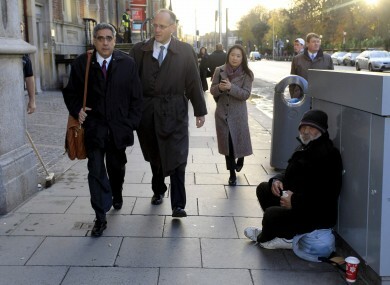 Ajai Chopra leads an IMF delegation to Dublin to negotiate the bailout in November 2010. IRELAND SHOULD NEGOTIATE a second bailout with the EU and IMF on a stand-by basis in case it cannot return to the markets by the time the first deal expires, an economist with one of the world’s biggest banks has said. Willem Buiter, chief economist with Citigroup, says the current market price for Irish borrowing remains prohibitive – and has suggested that Ireland should have a backup funding source in place in case the first €67.5 billion deal runs out. “Borrowing at 8 per cent, when you can borrow at 3 per cent, doesn’t sound like good business,” RTÉ News quotes Buiter as saying, referring to the current cost of borrowing for Ireland on the open markets and the interest charged on the EU portion of our bailout loans. He also told a press briefing that Ireland should not attempt to seek a second bailout “in a state of near panic” when the first deal comes to a conclusion, but rather have alternative funding in place. The Irish Times quoted him as saying that while Ireland was “not like Greece”, it remained in poor financial health because of the obligations it had taken on under the bank guarantee scheme. He also lent his voice to calls for the EU to allow Ireland reduce the interest it pays on €30 billion in outstanding ‘promissory notes’ – a form of IOU issued by the Irish state to banks, mostly Anglo Irish Bank, to fund their ongoing operations. Ireland was paying an approximate interest rate of 6 per cent on those bonds, but ought to be given a reduction to around 3 per cent, the former senior banker at the Bank of England said. This would not be a major concession on the part of the EU – because the write-down would be on banking debt and not the debts of a state – while it would also recognise Ireland’s efforts in following the terms of the EU-IMF bailout. The other two ways for Ireland to write down its obligations – by either withdrawing the bank guarantee or restructuring its national bonds – would probably not be acceptable to Europe, meaning Ireland was instead more likely to be given favourable terms for a second bailout package. The remarks come a day before visiting teams from Brussels and Washington visit Dublin for the latest quarterly review of Ireland’s progress under the terms of the €67.5 billion funding deal. Ireland has already drawn down over €30 billion of that cash – and expects the remainder of the funds to last for at least 18 months before it must go back to the bond markets. The National Treasury Management Agency is expected to proceed with a small number of experimental auctions of short-term bonds later this year, in an effort to gauge market interest in lending to Ireland. Email “Ireland should negotiate 'standby second bailout', says Citi chief”. Feedback on “Ireland should negotiate 'standby second bailout', says Citi chief”.